Comm Eye Health Vol. 16 No. 48 2003 pp 51 - 53. Published online 01 December 2003. Cataracts cause about 50% of world blindness. There is little likelihood of effective prevention becoming available in the next few years and so the only treatment will remain surgical. For many of the other major causes of world blindness, like trachoma, xerophthalmia and onchocerciasis, the remedy is community-based, not hospital-based, and requires prevention rather than treatment. The prevalence of blinding cataract will only increase as people live longer, so cataract will continue to be, by far, the most important treatable cause of blindness. Cataract surgical techniques have changed enormously in the last ten years, both in the developed world and the developing world, and will undoubtedly continue to change at an ever-increasing rate. Phacoemulsification is now the standard, and almost the only procedure in the developed world. For various reasons, most experts in the developing world do not see phacoemulsification as the answer to world cataract blindness, although there are a few ‘phaco enthusiasts’ who do. An effective cataract surgeon in the developing world is one who is doing high volume, low cost and low complication surgery. For many of these effective cataract surgeons, the operation of choice is now sutureless non-phaco cataract extraction, and others are changing to this technique. The purpose of this article is to try to describe the principles of this technique (there are several different ways of doing it), its advantages and disadvantages and how to avoid mistakes and complications. The incision is made so as to be self-sealing and as free from resulting astigmatism as possible. At the same time, it needs to be large enough to allow the entire lens nucleus to be removed in one piece. The nucleus is then mobilised inside the eye, and inside the lens, to enable it to be removed. The nucleus is then removed without damaging either the cornea or the posterior lens capsule. There are three parts to this. The opening into the sclera, the tunnel and the opening into the cornea. A superior rectus suture is inserted and a fornix-based conjunctival flap dissected. The incision into the sclera is about 8 mm long and usually shaped like a ‘frown’. It can be slightly smaller (6-7 mm), especially if the nucleus is small or the surgeon is very skilled. It can be even bigger and still remain self-sealing. The incision goes halfway through the sclera and can be made with any sharp knife or razor blade fragment. Because it is a little way from the limbus, it is quite vascularised and the blood vessels will need gentle cautery or diathermy first. At its closest point, it should be 2mm from the limbus. The incision can be made straight across rather than frown-shaped but the frown incision is said to produce less astigmatism. The incision does not need suturing because the large distance between the internal and external opening (at least 4 mm) makes the wound self-sealing as the intraocular pressure rises. Therefore, the length of the incision does not really matter. This is the most critical part of the incision and for this a standard crescent knife is used. Since the coming of phacoemulsification, these knives are readily available and usually ‘disposable’. However, with care between cases and disinfecting the blade in spirit-based povidone-iodine 10% solution or autoclaving at a lower temperature (115°C. ), one knife and handle should remain sharp for several cases, or even a whole operating list. First establish a plane of cleavage about half the thickness of the sclera and then enlarge by making sweeping movements with the crescent knife, both downwards 2mm into clear cornea, and then sideways at the edge of the incision. This makes a tunnel which stretches from limbus to limbus at the ten o’clock to two o’clock position (Figure 2). The tunnel must be ‘long’ and enter the eye well into clear cornea in order to be self-sealing and free of the risk of iris prolapse. It must be ‘wide’ in order to accommodate the entire nucleus. This is done with a sharp pointed phaco keratome knife which can be re-sterilised in the same way as the crescent knife. It is much easier and safer to cut against a firm eye than a soft eye, so it often helps to fill the anterior chamber with visco-elastic solution, like methylcellulose, once the first opening into the anterior chamber has been made. It is easier to make the cut with the sharp edge of the keratome as it goes into the eye rather than as it comes out. Having a firm eye also lessens the risk of creating a corneal endothelial rip, which is a possible complication of cutting obliquely through the cornea. In particular, one must be sure that the internal opening into the anterior chamber reaches laterally out to the limbus at each end. 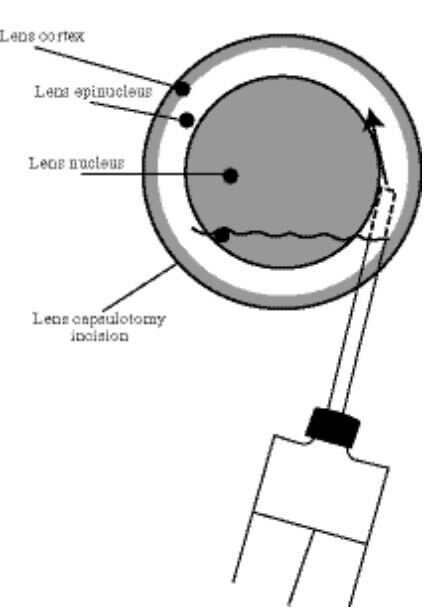 Once the internal opening is complete, many surgeons use the same keratome to make an incision at the top of the lens capsule, which is known as the endocapsular technique. Alternatively, this can be done with a cystotome but the incision in the lens capsule must be from pupil margin to pupil margin and big enough to allow the nucleus to come out easily. The nucleus must be mobilised and brought wholly or partly into the anterior chamber and for this the pupil must be well-dilated. Use both a parasympathetic antagonist (e.g., cyclopentolate) and a sympathetic agonist (e.g., phenylephrine 2.5% – 10%). Put the drops in about one hour before surgery. If mydriasis is started two to three hours before surgery, it may then start to wear off and the pupil become less sensitive to further drops. If the drops are put in only a few minutes before surgery, they may not have time to work properly. If possible, use a topical prostaglandin inhibitor (e.g., ketorolac) pre-operatively. This does not dilate the pupil but helps an already dilated pupil to stay dilated during the surgery. Add dilute adrenaline (1ml of 1:1000 adrenaline added to 500 ml of Ringer’s Lactate solution) which also helps to maintain a dilated pupil. This is added to the infusion bottle and the irrigating solutions for mobilising the nucleus. The nucleus is mobilised by hydrodissection and hydrodelineation using the infusion fluid, a syringe and a blunt cannula such as a lacrimal cannula. The main purpose of the hydrodelineation is to separate the hard central nucleus from the slightly softer epinucleus around it. By doing this, the nucleus becomes as small as possible. Hydrodissection mobilises and frees the nucleus and lens matter so that an instrument can be placed under it without any risk of damaging the posterior lens capsule. 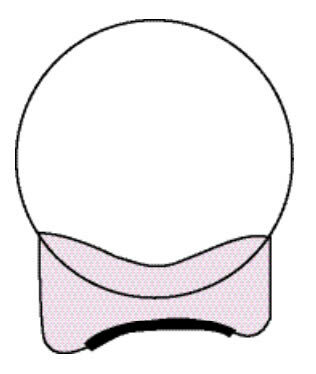 It is best to put the lacrimal cannula through the incision in the anterior capsule, and fairly deeply into the lens substance and slightly to one side, so that the pressure of hydrodelineation will spread fluid around the nucleus both above and below to separate it from the epinucleus (Figure 4). The nucleus must be mobilised either wholly or partly into the anterior chamber, which is why it is essential to have a fully dilated pupil and also an anterior capsulotomy of reasonable size. In patients with a fairly firm lens cortex, many surgeons do a hydrodissection by injecting fluid immediately under the anterior capsule in order to separate the lens cortex from the capsule. This will make removal of the lens cortex easier at a later stage. This is the hardest and most critical part of the operation but if the incision has been properly constructed, the pupil is well-dilated, the lens nucleus has been mobilised and the nucleus is not excessively large, there should be no problem. Various instruments have been designed for removing the nucleus. The easiest is probably the irrigating lens loop or vectis. It is helpful first to inject some visco-elastic, both between the nucleus and the corneal endothelium, to help preserve the corneal endothelium, and also just behind the upper tip of the nucleus to help insert the lens loop behind the nucleus without damaging the posterior lens capsule. The eye should now be rotated strongly downwards by traction on the superior rectus suture. This enables the loop to be in the best position to open the tunnel and help the nucleus to come out. The lens loop, mounted on a 5 ml syringe, is now inserted through the incision into the eye. The loop is advanced so its tip is just under the upper pole of the nucleus (this is why the previous injection of visco-elastic is helpful), and it is then slowly advanced further into the eye behind the lens nucleus. It may be helpful at this stage to inject fluid very gently through the loop so as to help keep the posterior capsule well clear of the loop. Once the tip of the loop has reached the lower pole of the lens nucleus, the nucleus can be extracted. It is particularly important to have the lens loop in the right position. It should be pressing downwards (Figure 5) on the posterior lip of the incision (as shown by the arrows A). This helps to open up the tunnel. The loop should be resting just behind the nucleus. There is always a great temptation to lift the tip of the loop forwards towards the cornea to ‘scoop’ the nucleus out of the eye. This temptation must be resisted. It will rub the nucleus against the corneal endothelium and permanently damage the endothelium. Instead, the nucleus comes slowly out of the eye because of the hydrostatic pressure created by more forceful pressure on the plunger of the syringe (B in Figure 5). This raises the pressure in the anterior chamber, and this pushes the nucleus into the tunnel (arrow C). 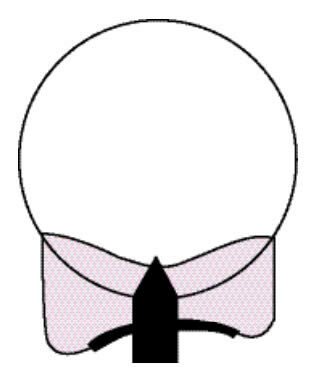 Once the nucleus has entered the tunnel, the lens loop is gently withdrawn whilst maintaining the hydrostatic pressure of the injection (B in Figure 5) and also slight downward pressure on the posterior part of the wound (A in Figure 5). As the loop is gently withdrawn it helps drag the nucleus through the tunnel and out of the eye. Once the nucleus is in the tunnel and no longer in the anterior chamber, the lens loop can, of course, be used as a kind of ‘scoop’ because upward pressure now can no longer damage the corneal endothelium. Once the nucleus has been removed, the epinucleus and the cortex are removed by irrigation combined with aspiration using a Simcoe cannula. There are various alternative ways of removing the nucleus. The technique pioneered by Dr Hennig from Nepal uses a small, sharp hook rather than a lens loop to remove the nucleus (Figure 1 on page 49 of this issue). The technique pioneered by Professor Blumenthal from Israel uses an anterior chamber maintainer (Figure 6) which is inserted at the lower part of the cornea to maintain the hydrostatic pressure throughout the operation. A plastic lens glide is used to open the tunnel and remove the nucleus. The anterior chamber maintainer is particularly useful when operating on young patients with either developmental or traumatic cataracts. In young patients it is very difficult to maintain a full anterior chamber and prevent the posterior capsule and vitreous coming forwards. The use of an anterior chamber maintainer keeps the anterior chamber deep and the posterior capsule and vitreous well back throughout the operation, and makes the successful removal of this type of cataract without damaging the posterior capsule very much easier. There should be no need to suture the sclera. Some surgeons like to close the conjunctiva with one suture at the corner of the conjunctival flap. The tunnel may enter the anterior chamber too near the angle so the iris keeps prolapsing through the wound. The nucleus may remain behind the iris or it may not be possible to mobilise it at all into the anterior chamber. The nucleus may be particularly large and hard. The best solution to all these problems is to convert to a standard sutured extracapsular extraction. The incision in the sclera is extended right along the edge of the shaded area in Figure 2 and Figure 3, and the incision can be further enlarged, if necessary, with the use of corneal scissors or a blade. There are some skilled surgeons who use techniques to divide a particularly large nucleus into two or more fragments and, in this way, are still able to remove a large nucleus using a sutureless tunnelled incision. There is also a simple manoeuvre which may help to remove a nucleus which has definitely entered the tunnel but has become stuck in it. 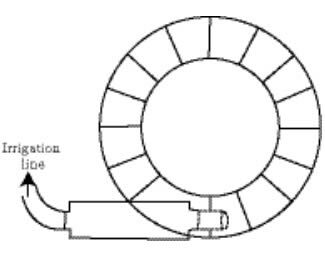 A lens dialler can be passed along the tunnel in front of the nucleus and the point of the dialler then turned down into the substance of the nucleus. This, with the lens loop which is behind the nucleus, can act as a ‘sandwich’ enabling the nucleus to be pulled out through the tunnel. For the expert, sutureless cataract surgery is an extremely quick and effective operation which can be performed on almost every patient. For the beginner, it is definitely harder than the standard extracapsular technique. It is best to wait until one feels entirely confident with routine extracapsular surgery, and choose cases which are going to have fairly small nuclei and well-dilated pupils. It is also essential to have a really sharp crescent knife and keratome to make the incision, and a well-manufactured lens loop – preferably one with more than one irrigation hole at the tip. This article is available as a chapter insert for Eye Surgery in Hot Climates 2nd edition by the same author.